bigbrakes4u.co.uk - GSM Brakes - Big brake conversion specialists including brands like Brembo, D2 Racing, Hi Spec Motorsport, K S .. This e-store is part of GSMPerformance. We are a family run company based in Nottinghamshire and we set up this huge brake conversion specialist site to make sure that we cater for your each and every braking need. 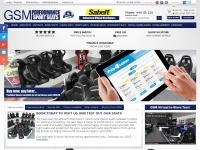 We also research the market weekly to ..
On-line and in-store we are Europe's only specialist in car seats, racing seats, sport seats, bucket seats, rally seats, classic seats, retro seats, motorsport seats, racing harnesses, office race seats and gaming seats. We research the market weekly to ..